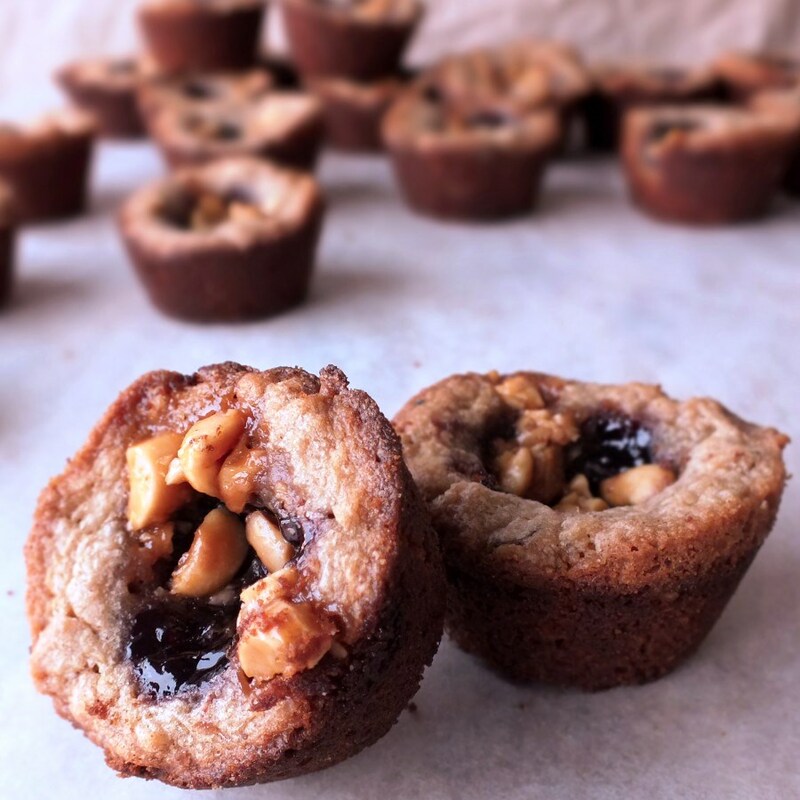 I basically took a pb&j blondie recipe I’ve been eyeing, from Bon Appetit, added some toasted rolled oats, and converted them into cookie cups, increasing the roasted peanuts and jelly per (blondie) cookie. The result is a very addictive, moreish recipe that’s easy to make right away with minimal effort. Enjoy! Preheat oven to 350 degrees F. Grease 24 mini muffin molds. I used a baking spray that had butter and flour. Set aside. Sift and whisk dry ingredients together into a bowl until blended well. Set aside. Toast oats in a sauce pan at stove top over medium high heat. Remove pan from heat when oats are toasted, slightly brown. This takes a few to several minutes to toast. Add oats to flour mixture. Cream butter and sugar until fluffy, add vanilla, blend. Add egg, blend well. Scrape down sides as needed. Add peanut butter. Mix until well incorporated. Sift flour mixture on top of butter mixture and fold gently but thoroughly until flour is no longer visible. Do not over mix. Using a tablespoon or a small ice cream scoop, divide batter into 24 muffin molds. Using the back of a spoon, smooth out the batter, making a slight indentation in the center. 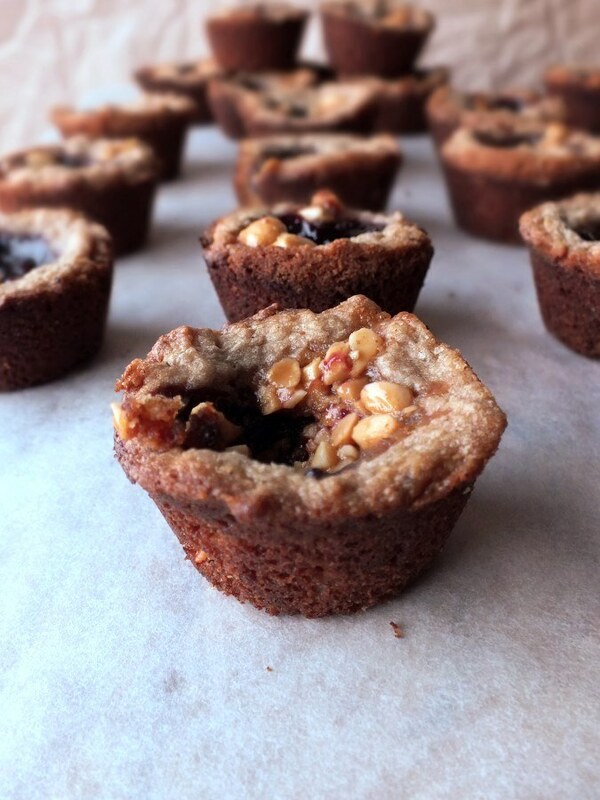 Add a 1/4 teaspoon of jam or jelly to the center of each cookie cup. Coarsely chop the peanuts and add the honey or caramel (optional) mixing it together with finger or spoon in a small plate. Add a very small amount of the peanut/honey mixture, dividing it equally to 24 cookie cups. If you run out, you can always make another half batch of the chopped peanut/honey mixture. Place in the center rack of a 350 degree oven. Bake for 10 minutes. Ovens vary, so it may take slightly shorter or longer to bake. Mine was slightly darker than I prefer on the sides at 13 minutes! I recommend 10 minutes, give or take a minute, because when I checked it, they were already slightly brown, thought slightly soft in the centers, but I suspect that the center will harden as it cools. Leave to cool on a rack in the molds. Carefully unmold using a knife to lift from each mold. If it is still warm it may be soft and easy to crumble. I decided against topping with salt of any kind, but feel free to do so. It was plenty salty for my taste. 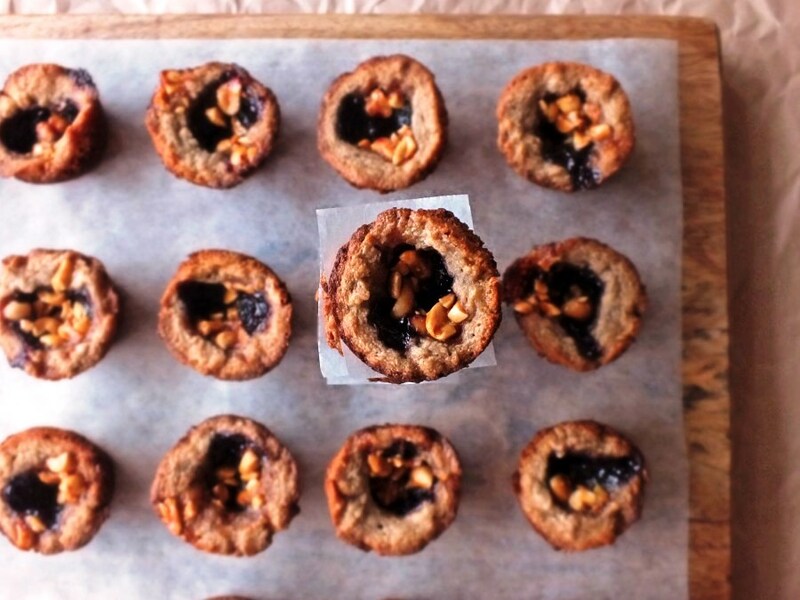 This entry was posted in baked goods, baking, cookies, dessert, snack and tagged caramel, cookie cups, cookies, honey, jam, mini-cookie cups, pb&j cookie cups, peanut butter and jelly, peanuts. Bookmark the permalink. Done and done! Totally making this to take to a dinner party this weekend! You can never go wrong with PB & J! Those pb&j bites look so good. Do you think they would be good or keep well for shipping? I think they would make a great addition to my holiday cookie boxes. I’m not sure. They seem good after two days, but they seem a little bit softer than I’d like. I wish I could tell you, but I’m horrible at guessing how cookies keep and whether they travel well.